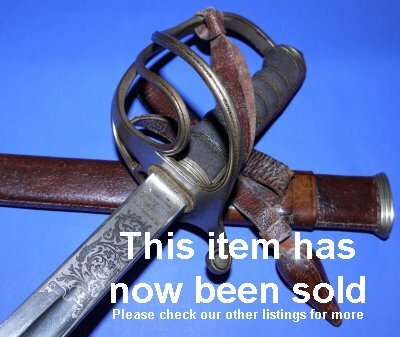 In good condition, a George V / WW1 British Royal Artillery Officer's Sword. Serial number 17807 to spine, etched to outfitter "R Groves 96 Wellington Street Woolwich"; Groves was in business from 1892 to 1912 . The 34 1/2 inch blade is overall good, a little worn, with very little patina rust and firm in the hilt. 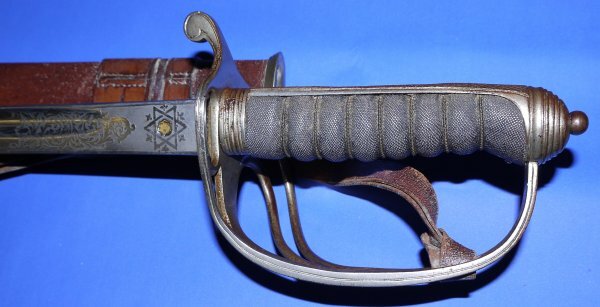 The three bar hilt also good, as are the fishskin grip and associated twisted grip wire bindings. 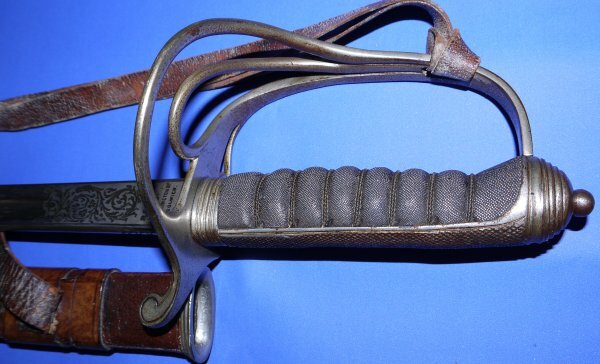 The leather field service scabbard is good though aged but a little loose on the sword. The sword knot with age but sound. Yours for £? (too late, now sold). Please quote item reference R95. Further / full sized images available upon request.